This square molded shipping case features blow molded construction to create a strong, yet lightweight, case. Interior dimensions of 34" x 14" x 14"
Will this case hold an 8x8" Burst display? I'm looking to replace the soft-fabric hopup case that came with the display as it is wearing out. I'm not familiar with the Burst display, but this case has interior dimensions of 34" x 14" x 14", so if your display will fit within that space, then this case should work fine. How many pop-up banners will this case hold? It would depend on the dimensions of the banners. The interior space in the case is 34" x 14" x 14" so you would need to measure your banners to figure out how many would fit. If you need help with that, contact us with the dimensions of the banners in their cases and we can help you do the math. 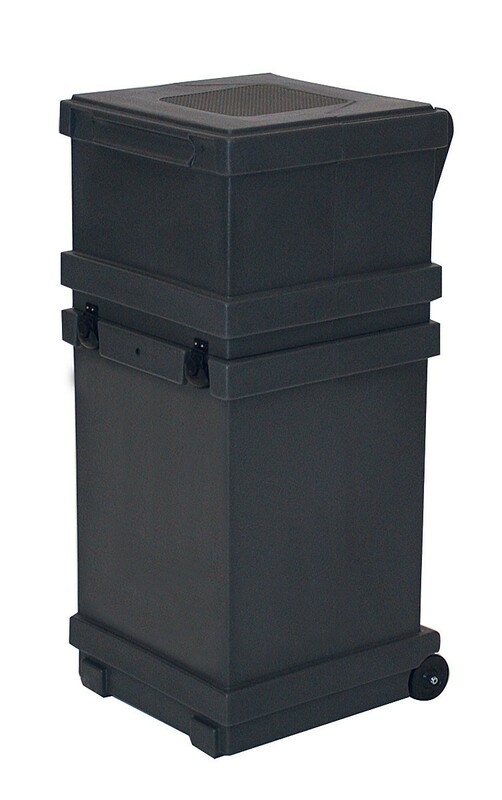 This square molded shipping case features blow molded construction to create a strong, yet lightweight, case. Made in the USA, this case include reliable built-in wheels and molded handle. This case can be used to ship up to a 4x3 HopUp configuration, the Mesa Pop Up Counter, or multiple banner stands. Interior dimensions of 34" x 14" x 14"
Interior Dimensions: 34" x 14" x 14"
Exterior Dimensions: 38" x 18 x 18"